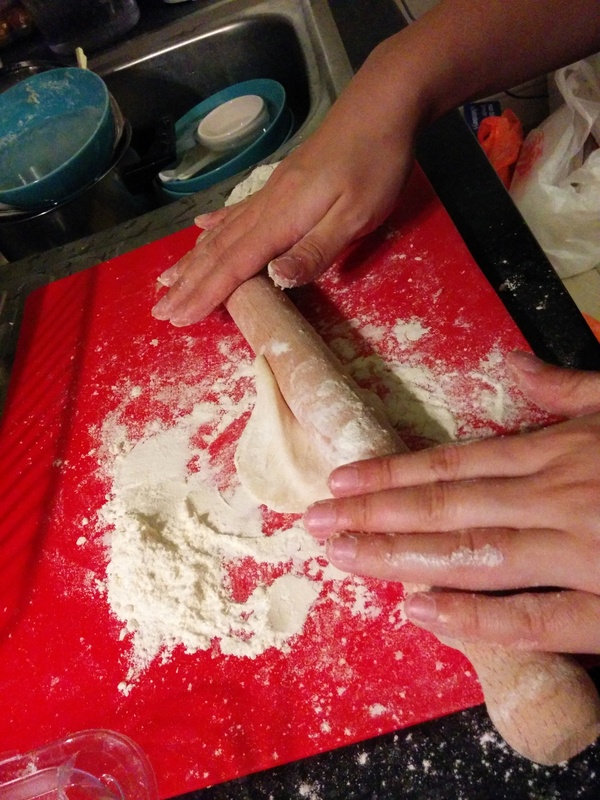 For the longest that I can remember, my mum’s always been able to make these fabulous dumplings (鍋貼) by hand. Time to follow in dear old Mum’s footsteps! 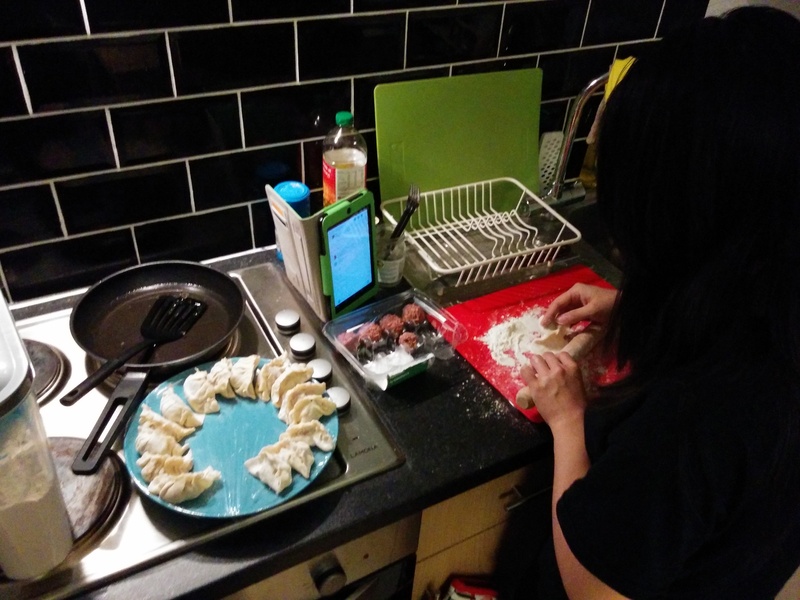 Typically she’ll start off by mixing the filling for the dumplings. Traditionally the filling is a mixture of pork, ginger and sometimes chives, but she often uses finely chopped Taiwanese cabbage and spring onion as well. As you can see, this is also the part where I cheated. I know, cheating so early on is not something to be approved of (sorry Mum!) but I’ve mentioned our tiny storage space and I didn’t think we’d have the shelf space for a large bowl of filling along with everything else. 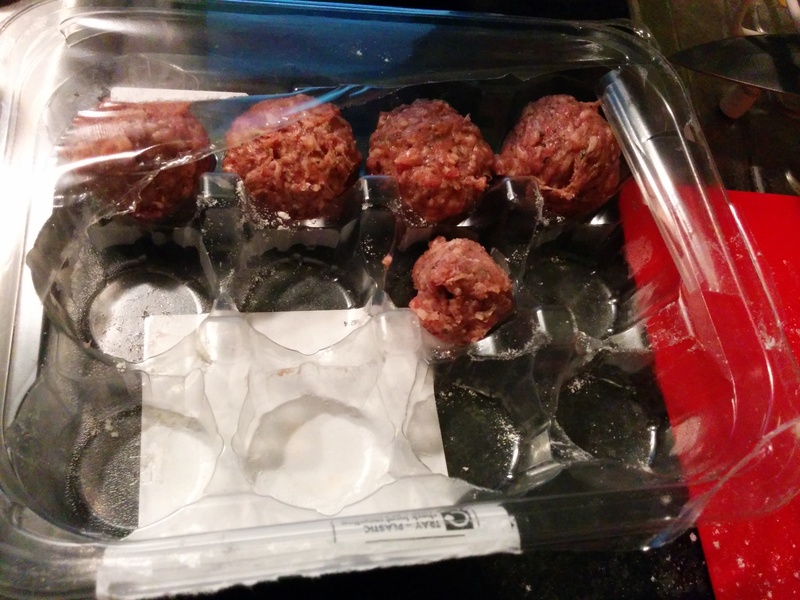 Instead, what I did was buy pre-made, minted lamb meatballs from Sainsbury’s reduced section, and I’m pretty sure Mum approved of my resourcefulness (actually, she laughed really hard, but I’d like to say her laughter was tinged with pride). Each meatball was enough for two dumplings. The dough is where I did Mum proud: flour (1 cup), boiling water (1/3 cup), slightly burnt fingers (because I hate things sticking to forks) and a wooden rolling pin were all that I needed to make dumpling wraps. With my meat portioned out and dough pieces being rolled out on a floured board one at a time, the dumplings quickly piled up on the plate. 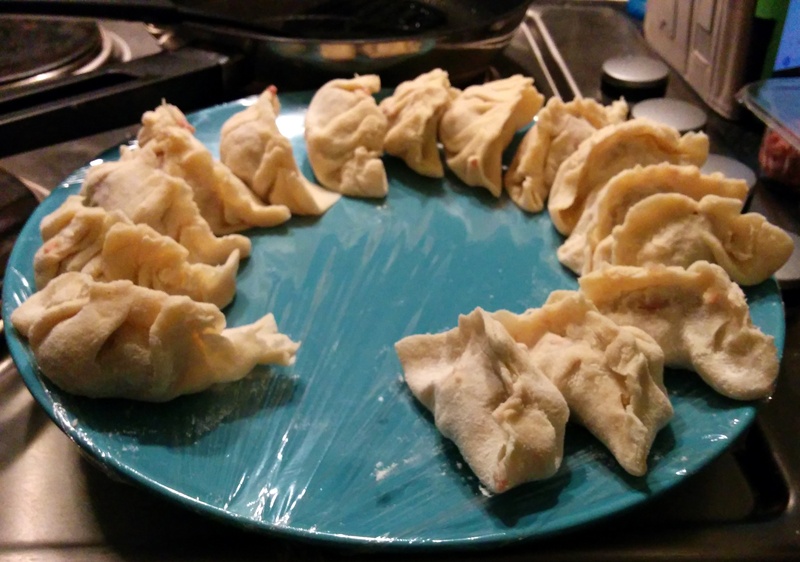 These went into the freezer so that we could have dumplings on another night, and that happened soon enough when Artemis visited for dinner. Unfortunately we ate them so quickly that I forgot to take a picture, but I’ll do so next time. Surprisingly the lamb wasn’t a bad substitute for the usual pork-and-choy mixture Mum used.